This document is designed to assist you in setting up automatic email notifications for missing assignments. Parents and families can choose to receive automatic notification once each day about the existence of any assignments marked by a teacher as missing. Please follow the steps below to begin receiving these emails. 1. 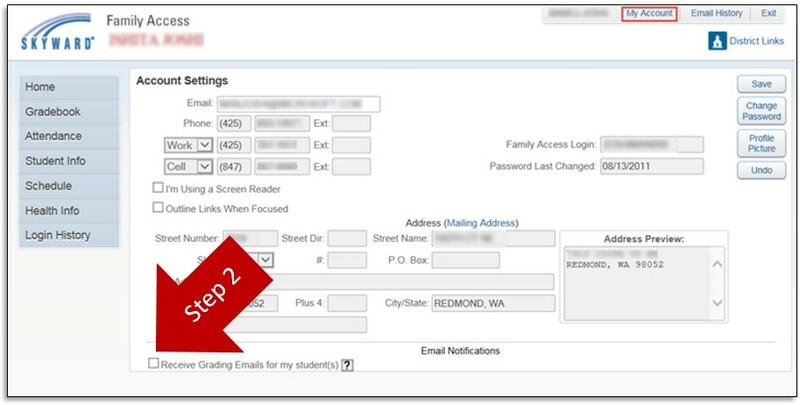 Log in to Parent Access and then click the link titled [Family Access]. 2. Once inside your Family Access account, select the My Account tab, top right on the page. 3. In My Account, select the checkbox at the bottom left of the page that enables email notification. It states, “Receive Grading Emails for my student(s).” Then SAVE.